Coaching materials, tips and recommended sites will be added to this page. Check back often. U-Tube had many drills for basketball. Please note that for younger players, you should simplify the drill and how you communicate it to the players. You can start simple and slowly build on drills to make them more complex. Depending on the make up of your team will dictate the pace you need to teach them. NYBA Coaches Handbook for Recreation is on the Documents page. Travel league web site: http://www.metrowestbball.com/sportsite2.html (Metro West League) for League Guidelines and Rules. NYBA Foul and Time Tracking Spreadsheets are on the Documents menu item. For those who may be interested in obtaining a great youth basketball coaching video, particularly geared for those coaching within the younger aged divisions, we recommend a DVD entitled: "Bob Bigelow's Coaching Youth Baseketball the Right Way". 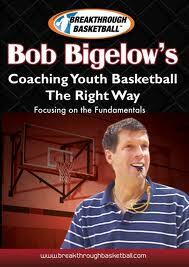 The URL to purchase the Bigelow DVD is http://www.breakthroughbasketball.com/pr/bigelow-youth-right-way.html.